Marketing experts advise companies to use prominent calls-to-action (CTAs) for their websites, social media, emails and any other communication. We are to tell people exactly what we want them to do – a single action. But what if they aren’t ready for it or interested? That’s where secondary calls-to-action come into play. What is a Secondary CTA? A secondary CTA is a call-to-action that provides an alternative action to the primary action you want people to take whether they are website visitors, prospects or leads so you don’t lose them altogether. They let you further engage and potentially capture people who are not interested in your primary CTA or may need additional information before taking the desired action. Your secondary CTA is typically less prominent than your primary CTA and requires less commitment. For example, your primary call-to-action may be to start a free trial period for new software with a secondary CTA to take a tour of the software’s features. This example is from Moz, where it is promoting its new marketing analytics software, Moz Pro. If you are like me, you want to get more information to maximize your 30-day free trial experience, or you may prefer to just jump in. Moz kindly provides you with both options. People today are spending more and more time checking out your business and researching the solutions to their needs. This is especially true in the complex B2B environment where the conversion process can be quite long or any large personal purchase like a car. Sending people to an online demo, related articles, etc. will keep them exploring your website instead of jumping to your competitor’s. Ideally, primary CTAs match where a person is in the conversion process. However, a lead may have already downloaded multiple e-books or articles but still may not be ready to move ahead. If you are using tools like progressive profiling, then you can gather more information on a leads as they continue to convert on the secondary CTAs to create better personalized lead nurturing campaigns. Despite sophisticated technology, we can never truly know when someone is ready to move forward in the sales process. Secondary CTAs at least keep people moving incrementally along, which is better than not at all. You may also have people who have only converted on a couple offers so you don’t feel comfortable for the big score just yet. However, what if you provided a lesser option as a primary CTA and the big one as your secondary? Some people may be ready to make the big commitment. They don’t need any more nurturing. This way you’ll get both groups. Not every call-to-action has to be focused on the “ideal” sales action. Other actions may be just as important to your company. These actions can be used as either primary or secondary calls-to-action based on your current goals. You can have the CTA involve social sharing and connection, email newsletter subscriptions, promoting a company-sponsored event, fundraising or any number of other business goals. So don’t just create primary CTAs and walk away. Instead, make sure you are capturing and converting as many people as possible with the addition of quality secondary CTAs. You may be surprised how many people will take the ultimate action with just a bit more nurturing. Shopping, researching, and searching for products or services online using multiple devices is becoming more and more common, but phone calls are still an important part of the buying process. In fact, Google reports that paid search ads send over 40 million calls each month, and 70% of mobile searchers report that they click to call directly from the results making it the most used feature on a mobile search results page. To understand the role of click to call in the buying process, Google teamed with Ipsos Research and surveyed 3,000 mobile searchers who had recently made a purchase from one of seven business verticals: travel, restaurant, auto, local services, retails, finance and technology. The research found that click to call is important for all business verticals, but when it came to searching for local services, 76% of the group would use the click to call function to schedule an appointment. Not only is the click to call function an easy way for searchers to connect with a business, AdWords advertisers that use click to call in a paid ad see an increase of 8% in click through rates. Additionally, three out of four calls sent from mobile paid search ads lasted longer than 30 seconds, and on average longer than 6 minutes. This means that calls from paid ads were not quick informational calls, but longer conversations to gather information or make a transaction. And 61% of participants found it “extremely important” to be able to call the business during the decision making phase of the buying process. The research also found that the lack of a phone number in search results, either paid or organic, also effects brand perception. Half of research participants said that the lack of a call option makes them frustrated and more likely to find another option. On top of that, 33% of participants noted that they would be less likely to use the brand, or refer a friend to it without the click to call option. Is click to call part of your mobile marketing strategy? If not, it should be! Contact us; let’s increase the volume of valuable calls to your business starting today. Google has reshaped the format of what was referred to as the “7 Pack” of local map search results for a Carousal format at the top of the search results page. Officially launched last month, the new Google Local Carousel format appears for a handful business verticals in several markets, with more being rolled out over time. Some of the top businesses that users have reported seeing in the new format include restaurants, hotels, bars, and local services. One of the advantages of the Google Local Carousel is that businesses who rank below the fold, or don’t rank well at all, have an opportunity rank at the top, even if it is horizontally. With this format, the result listed forth or fifth has as much of a chance of reviving an impression as those ranked first. While there is no guarantee that your local result will show up in the Carousel, the listing still needs to stand out. Since the most prominent feature of the listing is the photo, make it a great one! High-quality, eye-catching, attractive images and logos will get more clicks. Currently both Map and Carousel results are showing up in most markets, and early testing shows that 48% of searchers click on the Carousel, while 14.5% click on the Map. (That test stat is via the friendly folks at Search Engine Land.) However, searchers may be clicking on the Carousel more than Maps because it’s a fun new feature. The not-so-great news about the Local Carousel is that the results don’t link directly to the businesses website, and instead go to a page of branded results. This requires the searcher to choose from websites that also rank for the branded term including review websites (like Yelp, TripAdvisor), Facebook, or directories that have the opportunity to grab the customer. The use of the carousel format in website design isn’t new, and some usability experts think that the functionality is ineffective and causes accessibility issues for screen and keyboard readers. Website usability expert Jared Smith decided to answer the question of using this format, by using a carousel. 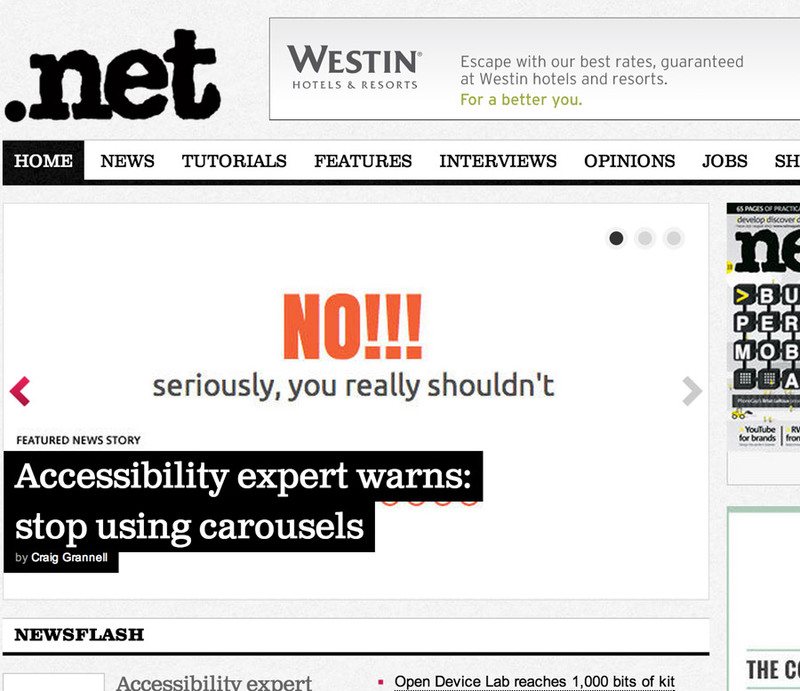 Yesterday he spoke with NetMagazine.com about his site, ShouldIUseACarousel.com, and the site promoted the article within their own carousel. What results have you seen, and which have you clicked on? Are you more likely to click the Carousel or on the Map? What do you think about the carousel format on any website, do you like it or not? Google’s announcement of the AdWords upgrade to Enhanced Campaigns is one of the bigger changes that has affected PPC campaigns and strategies in awhile. Enhanced Campaigns are designed to address searching in an increasingly mobile and multi device world by controlling bids and ad targeting based upon segments including search intent, time of day and device. In February, Google launched Enhanced Campaigns, and by mid-May they are rolling out an additional feature that will provide more control over mobile bids. Originally, mobile bids adjustments in Enhanced Campaigns were only available at the campaign level making it difficult to manage. But this recent update allows the ability to set mobile bid adjustment and control on the more granular ad group level. This is an important AdWords update in response to the ever growing amount of mobile searches on multi devices that happen more and more everyday. Historically PPC managers had their own work around for bidding on searches done on mobile devices, tablets and computers, so this update also means a shift in management strategies. 77% of mobile searches that happened during the day were preformed from home or from work. 59% of mobile searches happened after 3 PM, and 22% of those occurred between 8 PM and midnight. 55% of conversions happen within one hour, and 63% of all follow-up actions occur within this timeframe. After that one hour time frame, 81% of conversions happened within five hours of the search and 84% of all follow-up actions occurred. 45% of mobile searches were done with the intent of helping to make a decision. 66% of mobile searches happened while people were in a brick and mortar store. Clearly mobile search is gaining importance, so the first step to maximizing mobile PPC efforts is to dig into the data. Review past mobile CPCs, time of conversions, and locations, then figure out the formula to optimize PPC bids to capture as much qualified mobile traffic as possible at the right time. At some point in time as a PPC manager you inherit an account. It may be from another agency or from an independent contractor, and it may be because the client was unhappy with the results, wants to change things up, or it’s an internal switch. Like any successful relationship, the key is to honestly communicate from the start to establish trust between the yourself and the client. It is worth taking the time to get to know the client and how you can best impact the account and their business. Having an in-depth conversation to clearly understand the client’s goals, expected results and expectations is the first step. PPC is just one piece of marketing, so understanding how it fits into their overall business strategy and knowing what factors affect their bottom line is essential. Is there a seasonality to the business? What is the sales cycle? A week, a month, a few hours? What is the average value of a lead? Who is their target market? Who matters to them? What marketing messaging has been successful in the past? What has been unsuccessful in the past, what have they learned? Understand the KPI’s of the business so together you can develop realistic goals that will enhance the bottom line. What their established KPI measurements are and what they should be aren’t always align, so work together to create practical goals for the short term and long term. I prefer 1 month, 6 month and 12 month goals, which can be update as the campaign moves forward. What is considered an online conversion? An online sale, a sign-up, perhaps a phone call? What is the average number of conversions per week, per month? How many of those are driven from PPC vs. other channels? How do you measure success, is it reasonable? What are the benchmarks they want to achieve in the next month, 6 months and year? What reporting do they prefer? Weekly or monthly emails and updates? In-depth reviews? Once you know the business, understand their goals and the metrics that the PPC campaign will be measured on, it’s time to jump and review the campaign itself. Take note of campaign and ad group structures. Run reports on top keywords, look for trends. Do an audit of both duplicate keywords and negative keywords. Review campaign settings including ad scheduling, geo targeting, device settings, networks, bid types and budgets. Review keywords and match types. Test and take note of landing pages. Check to see what ad extensions are in play. Review dimensions of each campaign and ad group. Check display network audiences, topics, placements and exclusions. Take notes about the campaigns and write down questions that you have for the client. This is also the time to export reports, and take snapshots of dashboards or KPIs so you can create campaign benchmarks to measure against in the future. With clear communication, research and planning, you can start off on the right foot to being campaign cleanup and optimization.